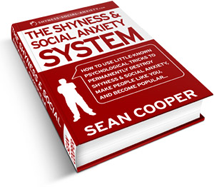 Looking for more information how to overcome your shyness or social anxiety? Look no further... check out these free articles and get the understanding to help you get past your issues. Read these articles to find out the little-known cause of your shyness or social anxiety, the difference between the two, and how to begin overcoming these issues. Learn how to make conversation and small talk naturally. What you should talk about to sound interesting. How to make eye contact as you talk. How to quickly make yourself less nervous talking to people. Read about how to increase your self esteem. Resolve your inner insecurities about your looks. Overcome feelings of inferiority. Learn why you are afraid to wear cool clothes or get a new haircut. Learn about how to boost your confidence. Make a better, more attractive impression on people. Avoid body language mistakes most shy and socially anxious people make. Be able to walk past people on the street without feeling anxious.